The first term defined “free exercise of religion” means an act or refusal to act that is substantially motivated by sincere religious belief. Looking towards the First Amendment free exercise of religion, your religious beliefs are conveyed to your children through observation and participation. Your children learn through personal example. When your children observe you living your religious beliefs you are exercising religious freedom. You might do this by either doing something like reading a bible story to them, or not doing something, like teaching them not to take the lord’s name in vain. You might have thought that this section only applies to specific provable religious ceremonial type activities, but that is not the case. This chapter is an expansive definition of religious freedom that doesn’t require you to be doing or not doing something that is specifically written down in your religion’s codes or philosophies. This statute makes an important distinction under this definition that your act or refusal to act doesn’t have to be motivated by a central part or requirement of your religion. This means that something is a religious act if you make a convincing argument that it is, even if your religion doesn’t have a formal requirement or prohibition. The effect of this is that it requires a wider interpretation of the range of religious expression that is protected than courts might otherwise find. This is good for parents in less formal religions and helpful for parents who may not be specifically religious by traditional definitions. Subsequent posts on this topic will continue to explain the power of this statute and how it applies to parents in SAPCR proceedings. You will also find that we have created a package of training and assistance with using this statute in your case. Soon you will learn that this statute also gives you attorney’s fees and costs paid for by the state of Texas. You may even get compensatory damages for the harm the court did to you and your child up to a maximum of $10,000. So, keep reading and when you have completed the free materials, inquire about the Texas Religious Freedom Package that provides tools and shortcuts that you and your attorney might be able to use to win your equal rights to your children back and to avoid costly mistakes that could prevent you from receiving the protection of this statute. Subsequent posts on this topic will continue to explain the power of this statute and how it applies to parents in SAPCR proceedings. You will also find that we have created a package of training and assistance with education on how you might be able to adapt to your case.. Keep reading and soon you will learn that using this statute you may get your attorney’s fees and costs paid for by the state of Texas. You may even get compensatory damages for the harm the court did to you and your child up to a maximum of $10,000. 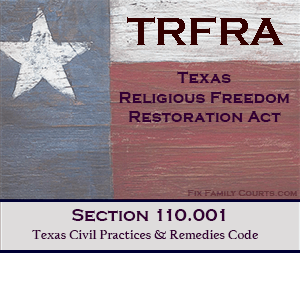 So, keep reading and when you have completed the free materials, inquire about the FFC Texas Religious Freedom Restoration Act (TRFRA) Package that provides tools and shortcuts that you and your attorney can use to win your equal rights to your children back and to avoid costly mistakes that could prevent you from receiving the protection of this statute. (1) “Free exercise of religion” means an act or refusal to act that is substantially motivated by sincere religious belief. In determining whether an act or refusal to act is substantially motivated by sincere religious belief under this chapter, it is not necessary to determine that the act or refusal to act is motivated by a central part or central requirement of the person’s sincere religious belief. (B) any agency of this state or a municipality or other political subdivision of this state, including a department, bureau, board, commission, office, agency, council, or public institution of higher education. (b) In determining whether an interest is a compelling governmental interest under Section 110.003, a court shall give weight to the interpretation of compelling interest in federal case law relating to the free exercise of religion clause of the First Amendment of the United States Constitution. Added by Acts 1999, 76th Leg., ch. 399, Sec. 1, eff. Aug. 30, 1999. * The authors of this post are NOT attorneys, we do not practice law, and cannot give you legal advice. What we offer is education on the laws and how they affect you and your children. We help you become better consumers of legal services from attorneys and we help you get better outcomes from the legal system by increasing your knowledge and understanding of how the system works for and against you and your constitutional rights. Make sure you check with an attorney for the legal technical procedures and how you might apply this to your case. We are not responsible for your results or consequences in your suit or dispute for anything you use from this site, packages, videos, or any other information that you get from us. Daily Tool: Trial Testimony…how to preserve error and avoid the best interest trap. ARE FAMILY COURTS EXERCISING LEGITIMATE AUTHORITY?